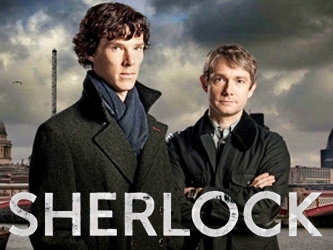 Last night was the last episode of the second set of the BBC's very popular Sherlock series. I'd heard of it sometime before last year's debut on PBS and I thought it was a damn entertaining re-imagining of Arthur Conan Doyle's singular detective. A lot of other people found it entertaining to - so much so that CBS courted 'creator' Steven Moffat to bring his update to American TV, an offer that he declined. CBS has gone ahead any way and is developing a show called Elementary that I can pretty much guarantee I won't be watching. Simple, adapting an adaptation is almost always an unsatisfying thing. Especially in this case. I can't see any way that American creators can take such a distinctly British character, transport him to New York and approach the classic stories in any more inventive ways than Moffat and 'co-creator' Mark Gatiss. (Gatiss writes for the show and also plays Mycroft Holmes.) It simply isn't encoded in American storytelling DNA to be that clever. And besides, all they're going to do is trade on the name Sherlock Holmes and hope for a hit. CBS already has a show that does all this AND stars a guy with a non-American accent. The 'creator' of that show has also acknowledged that The Mentalist harks back to Holmes. Sherlock, the BBC series, is clever and pays homage to not just Doyle's version, but also to the previous BBC iteration that starred the inimitable Jeremy Brett. There are little nods like camera shots that let the informed viewer know that Moffat and Gatiss loved that television series, too. Stars Benedict Cumberbatch and Martin Freeman both inhabit their roles as Holmes and Watson respectively, with all the elements that make the characters interesting and deep but it's Andrew Scott's portrayal of the supervillain Moriarty that makes the series fun. With his introduction in the third episode of the first series, Scott made Moriarty every bit the perfect opposite of Cumberbatch's Holmes. Except they're not really opposites, they just play on different sides of the street. (This is made exceptionally clear in the final moments of the third episode of the second series, but there's no spoilers here.) Scott seems to have pulled in not just Eric Porter's brilliant performance but also a bit of Orson Welles' radio version, too, while adding inflections that make the character his. I love watching him on screen and immediately recognized him from his very brief appearance on HBO's Band of Brothers. Only the British can make this kind of clever update and adaptation work so well and be so entertaining at the same time. Well, and Joss Whedon, but he's not anywhere near this project. Americans don't know how to do this, which is why we watch BBC programming on PBS (Monty Python or Downton Abbey, anyone?) and why there's a British cable channel here. We recognize great storytelling, we just don't know how to do it as well as our cousins across the Atlantic. The British seem to have a sense of history in their storytelling that Americans don't often match. Taking the time to adapt an adaptation is just silly especially since it already exists. The time is better spent in either supporting the adaptation by bringing it whole to America (which PBS does, though apparently there were a couple of edits for the American version of series 2) or in creating something NEW. It's also one thing to adapt an original property, such as Life On Mars, and another completely to adapt an adaptation. Sherlock is not new, it's updated. That's why I put the word 'creator' in quotes. The characters are the same, the setting is new and the stories are 'based on' Doyle's original work. I'll probably give Elementary a chance but not much of one. I'll just wait for series 3 of Sherlock. And while I'm waiting, I'll read Doyle's stories again and probably watch the entirety of the Brett series, too. I disagree entirely with the sentiment that American storytelling is somewhat inferior, but I'm having trouble articulating the idea in a way that doesn't sound like, "You're dissin' on my culture, bro!" I know it sounds like that, Ashley, but I'm really not. I just think that Americans don't have the sense of history - and thus, storytelling - that older societies do. Yes, there are Americans who can tell stories well, ORIGINAL stories, but in terms of adapting a concept that is itself an adaptation? Americans are NOT good at that. I don't think American storytelling is inferior, it's just different and better when it's original rather than a retread. Mark Twain stands out as a great American storyteller, as does George Lucas who took a concept, set some goals and made it happen. Lucas innovated filmed SF to the benefit of every storyteller and not just in film. The problem is that American readers and viewers don't reward originality as much as they do retreads. That's a fault of the storytellers as much as anyone. I offered Bruno Heller's THE MENTALIST as an example of American TV adapting the Holmes stuff in an interesting way. I didn't realize at the time that he was English, though. No, I understand your point isn't to specifically denigrate American storytellers, but I still disagree. It's just not easy to disagree without sounding like it falls into jingoist support of American storytellers. Mark Twain is a great storyteller -- George Lucas taking the concept of The Hidden Fortress and coming out with A New Hope doesn't seem like the best example here. Or we have The Lion King, quite beloved, as a retelling Hamlet. I don't think that the British have any more of a leg-up on transformative works by virtue of history. I don't think history has anything to do with it.